Foil stamp your logo on a clear cover in a variety of thicknesses. Enhance your presentation with a foil stamped sand poly cover. Ordering a custom foil printing for your covers is simple. Many companies and individuals want to display their logo or information on their covers in an attractive way. 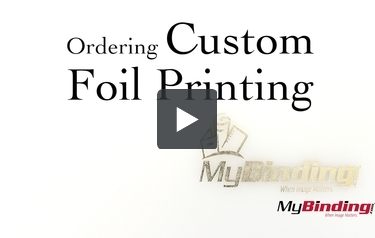 With Custom foil printings we give you the freedom to get exactly what you want for your project. We print them all in shop with your specifications. And we have a large variety of foil for you to choose from. There are two options for your prints—using letter typefaces to display basic information like this. Or we will create a custom die piece of an image you provide. All you have to do is send a black, vector based image up to 5x5.5 inches big in a PDF format. Isn’t everything better with a foil printing (or are we just biased? Call us to set up samples of your own design to see if we can foil your project!